Submissions should include a short biographical note with contact information and a self-addressed, stamped envelope. All critical essays should be submitted in MLA style. We encourage submissions via email or attachments in Microsoft Word format for Windows or Macintosh. MSR requests that upon notification of acceptance, the work(s) be submitted on electronically as an MS Word document. 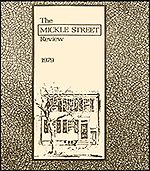 We invite readers to join the Mickle Street Review listserv in order to receive periodic updates about Mickle Street Review news and events. To join the listserv, please email us. We invite readers to join the Mickle Street Review listserv in order to receive periodic updates about Mickle Street Review news and events. To join the listserv, please email us.